In a remarkable example of PR spin, both the American College of Cardiology and Zoll, a medical devicemaker, issued misleading news releases this weekend trumpeting the results of a study examining the LifeVest, a wearable cardiac defibrillator. The LifeVest, which has been in use for nearly two decades, is sometimes prescribed to recent heart attack patients who have “low ejection fraction,” or a reduced ability to pump blood. These patients are thought to be at high risk of sudden cardiac arrest, and the LifeVest is designed to deliver powerful shocks that resuscitate a person when it detects a deadly heart rhythm. For years, a lack of rigorous LifeVest study results made it hard to know what the right thing was to do for patients. It’s a problem common to many medical devices: Compared to drugs, the FDA requires less evidence that devices are safe to use and work as intended, and many unsafe devices remain on the market, even when known safety problems exist. That’s why we and many others were curious to see the results of a randomized controlled trial, known as VEST, that was presented this weekend at the American College of Cardiology’s 67th Annual Scientific Session. 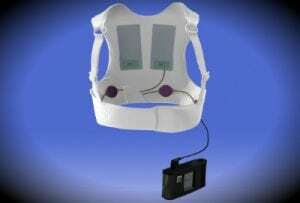 Would the LifeVest study results provide proof that the vest was worth the hassle? How would it be summarized and pitched to the news media? The findings: The study results for the primary endpoint were negative, meaning there wasn’t sufficient evidence to show the device reduced sudden cardiac arrest in post-heart attack patients. In the group that wore the vest, 1.6% died from sudden cardiac arrest, and in the group that didn’t wear the vest, 2.4% died. That was not a statistically significant difference. 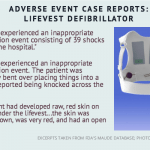 Yet two news releases issued by the devicemaker, Zoll, and the ACC, glossed over this finding, and focused on a secondary endpoint of the trial, which was the rate of overall mortality in the two groups. By playing up this finding, they made it seem like the vest was proven to work–and worth the cost and risks of wearing the device. Not only do they hype a secondary finding, they do so by using relative risk percentages to fluff up the benefit and make it look more impactful than it really was (which, as we explain here, is a common tactic used by researchers or PR teams trying to make results look better than they really are). 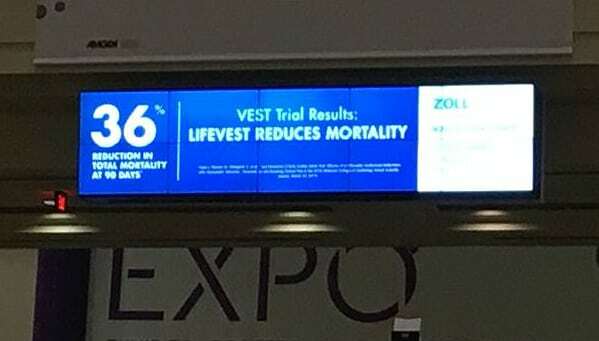 In this case, the news releases say the vest reduces total mortality by 36%. That sounds like a big difference. However, in absolute terms, 3.1% of the vest group died from any cause in the three-month period, and 4.9% died in the non-vest group, a difference of 1.8% percentage points. 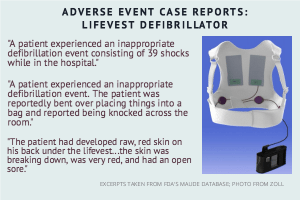 Based on the reporting from this Medscape news coverage of the meeting, researchers involved with the study speculated that it might be because some of the deaths in the vest group were attributed to other causes, when they actually died from sudden cardiac arrest. 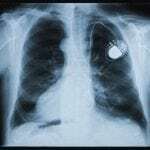 “This would reduce power for sudden death, but not for total mortality,” Jeff Olgin, MD, from the University of California, San Francisco said during his formal presentation of the trial, according to Medscape. Several cardiologists quoted in the coverage voiced skepticism around this theory, noting that until further research is conducted, we simply have no idea why there was a slightly higher overall death rate in the control group than the vest group. It could be due to chance, especially since the event rates were low overall, and because the difference in death rates was just barely statistically significant. As we’ve written about, there are extensive reports that the device causes problems for wearers–including serious skin rashes and inappropriate shocks. The same problems were seen in the trial. This spin was alarming to John Mandrola, MD, a Kentucky cardiac electrophysiologist who has long been openly critical of the vest, also referred to as a WCD, or wearable cardiac defibrillator. Why is it that your article never mentioned the fact when this trial started with the original primary endpoint of “total mortality” and that is was changed to “reduction in sudden cardiac death because they couldn’t enroll 4,500 patients?